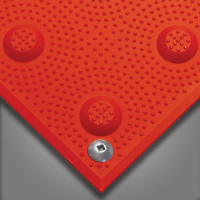 TufTile® ADA Warning Tiles feature a distinctive pattern of raised domes which provide a perceptible detection by cane or by foot warning of an impending pedestrian crossing. 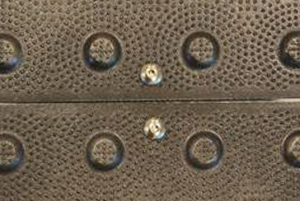 In accordance with ADA regulations, raised truncated domes have a diameter of nominal 0.9″, a height of nominal 0.2″, a center-to-center spacing of 1.6″ minimum and 2.4″ maximum. 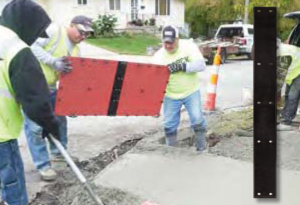 ADA Warning Tiles are “created” using tiles of various sizes: 24″x36″, 24″x48″, 24″x60″, 36″x48″, or 36″x60″. 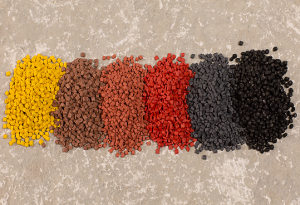 Fabricated of a homogeneous glass and carbon composite which is colorfast and UV stable; standard colors include: Federal Yellow, Brick Red, Clay Red, Dark Grey and Black. 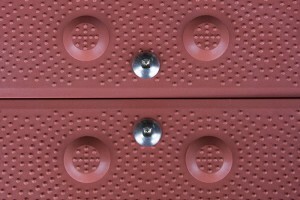 Tiles are replaceable, surface mount (includes fasteners and adhesive) and cast-in-place. The Americans with Disabilities Act (ADA) “recognizes and protects the civil rights of people with disabilities.” One sector of the ADA mandates that newly constructed pedestrian street crossings – curbs, curb ramps, blended transitions, rail crossings, medians and refuge islands – have detectable warnings for visually impaired individuals. The government also recommends retrofitting existing pedestrian street crossings wherever possible. 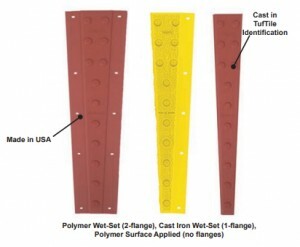 TufTile® Polymer Warning Tiles are made of advanced proprietary polymer and are engineered with molded in-line truncated domes which are in full compliance with ADA guidelines and provide superior impact and slip resistance. TufTiles® are also highly resistant to UV rays, weather, and a wide variety of chemicals. 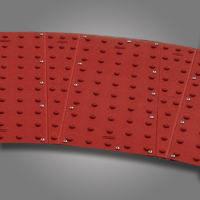 Engineered for superior impact resistance, slip resistance, and long term durability. Tuftile’s Polymer Wet-Set (cast-in-place) Tiles are replaceable high-impact detectable warning tiles designed for years of use on municipal (public) and private sidewalks, pedestrian ramps and platforms. Polymer Wet-Set tiles utilize a factory installed umbrella style anchor system with stainless steel, tamper resistant fasteners for easy installation into wet concrete applications. In developing TufTile we focused on both the polymer used in the production of our tiles and on the geometry of the tile. 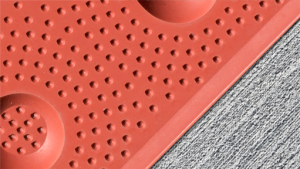 TufTile detectable warning tiles are designed with features that will ensure years of trouble-free performance. that offers exceptional performance characteristics. TufTile's Cast Iron ADA Warning Tiles are manufactured domestically with durable cast iron that offers exceptional performance characteristics. 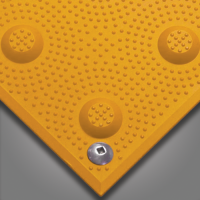 TufTile detectable warning products are designed with features that will ensure years of trouble-free performance. over the umbrella and the anchor becomes firmly integrated with the concrete. can be used multiple times in the event a tiles needs to be replaced. 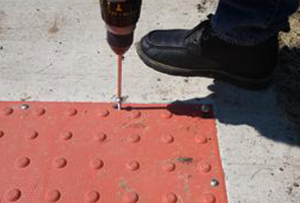 Occasionally, detectable warning tiles will need to be butted together to form longer and wider surfaces. 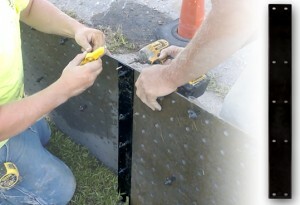 Radius Wedges in both Polymer and Cast Iron ADA Warning Tiles allow for fast, easy, compliant installation of most radius corners from 8’ to 70’ radii with no tile cutting. This results in a seamless radius installation with consistent dome spacing every time. TufTile® Radii are made by using wedges and tiles in any combination. 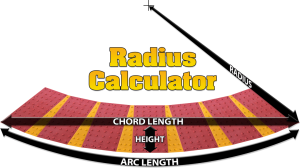 Four wedge sizes and five tile sizes combine to form a wide range of dimensions.Elevations remain equal and dome alignment consistent, piece-to-piece, reducing installer error. 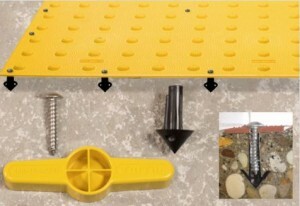 Wedges are factory pre-sized and designed to fasten to detectable tiles to form perfect radius assemblies. Very little field modification (tile cutting) is required. Only the very left-most and right-most tiles may need to be modified in field. Tiles have a smooth transition between the TufTile and other surfaces in addition to meeting ADA requirements.